This year we really pushed our luck and built a mobius strip. Once again we won the local award for structural ingenuity. 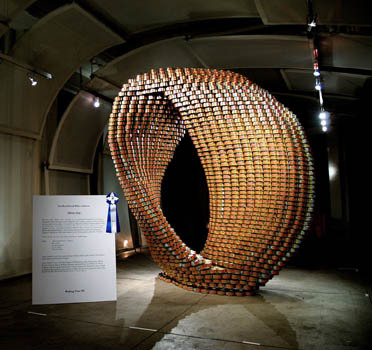 Our project was part of the media coverage of Canstruction by CBS, Reuters, Yahoo, NY1, Thai satellite tv and newspapers as far afield as Italy and India. I even got interviewed by Reuters TV. For a look at the sculpture under construction, have a look here.